Since July is National Ice Cream Month, I have decided to share a few more ice cream recipes this month. It’s been a mild summer so far in the Bay Area but I’ve been testing quite a few ice cream recipes. I love the smile on my children’s face when they eat my homemade ice cream happily. It’ll be sweet memories I cherish when they grow up one day. Two weeks ago our family went cherry picking in Brentwood, California. It’s about 1 hour drive from San Francisco, and there are many orchards and farm fields in the area. 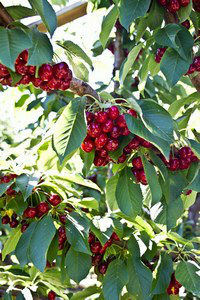 This was our 2nd year we went cherry picking with our friends and their children and we all had a great time. Cherry season is usually between May and June, so we were actually late this year going in the last week of June. Quite a few cherry farms had already closed for the season but we were able to find a few that were still open. It gets hot in this area so you might want to start picking fruits earlier in the day (we started around 9:30 AM) especially if you have small children. The cherries were $3 per pound, and we also went peach picking right after and they were $1 per pound. It’s the best way to get the freshest produce and also a great way to support local farmers. Most of our cherries were enjoyed fresh by themselves but I also saved some to use in this ice cream recipe. I didn’t get to use it for baked goods this time but if you are interested, I baked Cherry Clafoutis last year. For the custard of this ice cream, I used vanilla bean that I had won from Torview Toronto‘s giveaway (thank you Akheela!) instead of using just vanilla extract. I don’t make many desserts at home so this was actually my very first time using vanilla bean. If you like the vanilla flavor but never tried vanilla bean before, oh you will love it! I highly recommend to use the vanilla bean instead of just vanilla extract for this recipe. The flavor for vanilla bean is much more intense than vanilla extract and you can not only taste it, but can smell the sweet aroma while enjoying the ice cream as well. 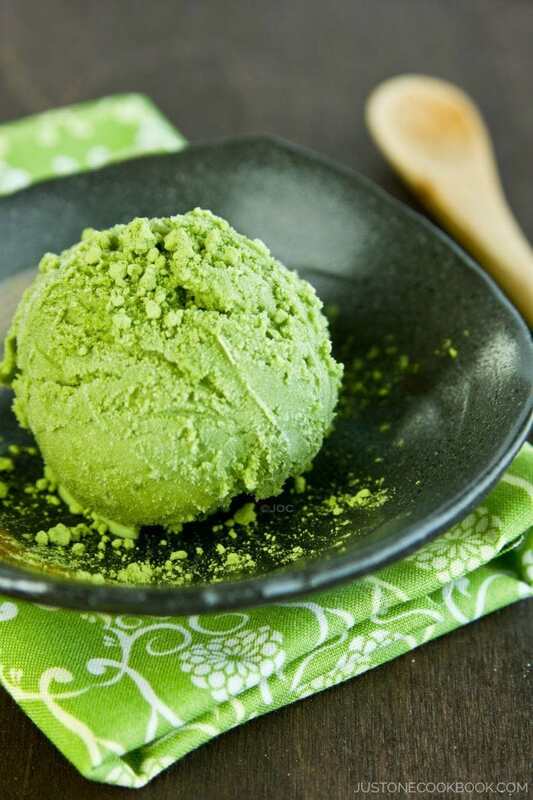 Coming up this Thursday is another popular Japanese flavored ice cream that had so many requests from readers, and I know some people have been waiting since last summer… so don’t miss this Thursday post! Cherry ice cream made with whole milk, heavy cream, vanilla bean and fresh summer cherries from local farm. 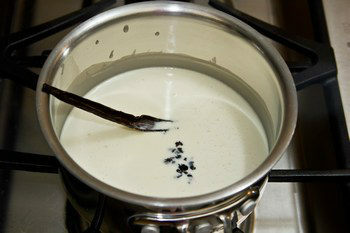 In a medium saucepan, heat 1 cup of the cream, sugar, and salt. Split the vanilla bean in half lengthwise with knife and scrape the seeds with spoon. Put both seeds and pod in the pan. 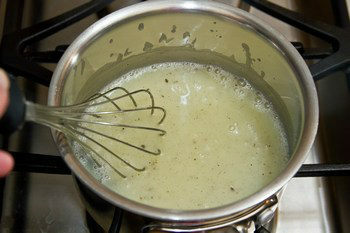 Stir the mixture over medium heat until sugar completely dissolves. 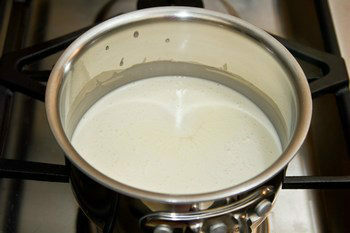 Remove from the heat and add the vanilla extract, the rest of the heavy cream (1 cup) and milk. Mix well. Chill the mixture in the refrigerator for several hours (or overnight) until completely cold. Pit cherries. 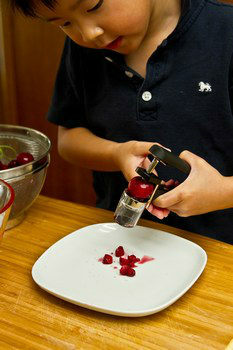 By the way, a cherry pitter is a great investment ($13) if you have small children who loves cherries or you enjoy making cherry desserts every year - it's super quick to pit cherries! 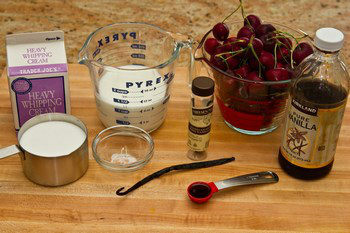 In last 5 minutes add in the cherries. My ice cream maker bowl is 1.5 QT so I had to stop churning and add cherries. Combine ice cream and cherries well. Put the ice cream in an airtight container and let it firm by freezing it for several hours. I LOVE ice cream…!! 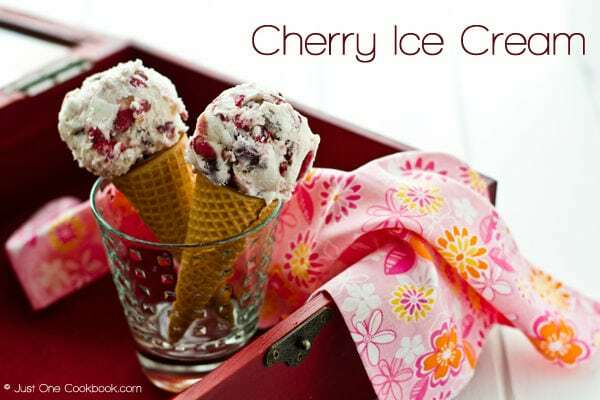 I have never tried cherry ice cream yet but yours look really delicious! 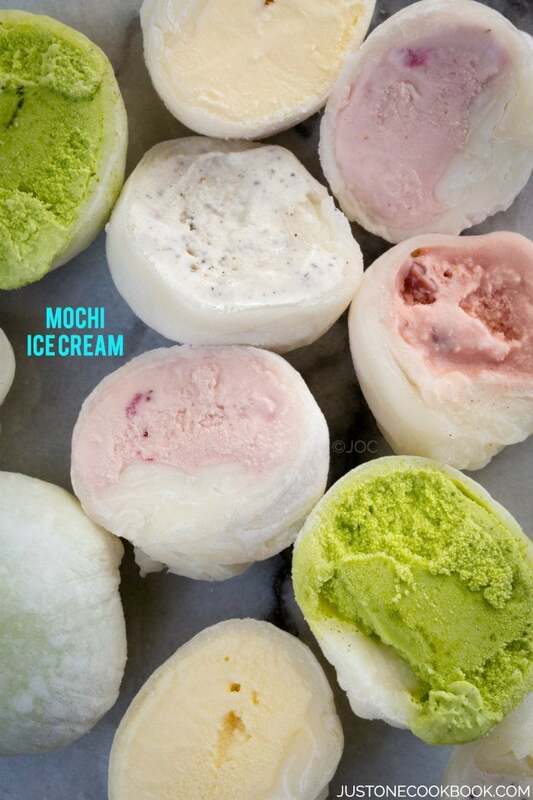 You should teach us how to make mochi ice cream one day, it’s one of my favourites…:D)!! I am not a big fan of cherries.. so strange to even say that when the whole world around me absolutely loves it:) Your pictures and styling of the ice creams are simply gorgeous! For whatever reason, cherry ice cream just makes me smile! And homemade makes it even more special. Think you have a budding gourmand there! I loves cherry very much and I loves ice cream……… and this makes me real happy if I could have a scoop now! 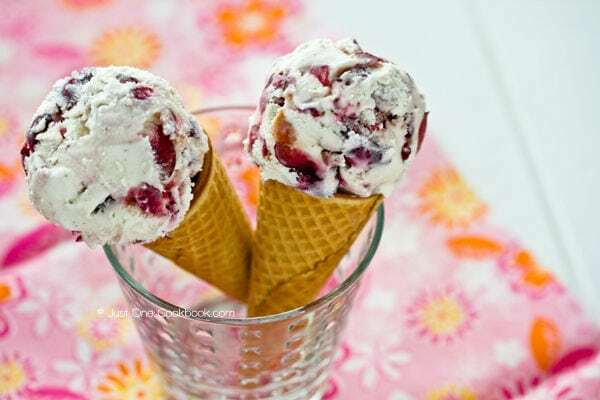 Your ice cream look really delicious and yummy with the chopped cherries in it. Your kids must really likes this lots and lots; and so am I!! Nami, I read quite a few of your comments on other blogs and I became curious, so I decided to visit your blog and wanted to send you a huge compliment – absolutely gorgeous photography and such wonderful and intriguing recipes! This cherry ice cream looks also so delicious, as do all the other recipes on your blog! Just wonderful! For anyone who says she doesn’t do desserts — holy cow this looks good. I wonder if you could rent out the cherry pitter for pitting duties? Then I could make this ice cream. I scream for (your) ice cream : ) just scrummy, Nami! Hey Nami, looks like u can read my mind! I always like my ice-cream with lots of ingredients, that’s why I like Ben & Jerry, Baskin Robbins etc. U don’t need an ice-cream maker to do this? It’s 8 am, but I need some of that Cherry ice cream for breakfast! Nami, what a fantastic ice cream. My aunt would love this recipe – she adores cherries. Nice to see you had help in the kitchen and the color is so pretty. Cherries are super expensive around here but I’d sacrifice a trip to TJ Maxx to have some of this on hand. Smply beautiful photos! Love cherry ice cream. Cherry icecream is a very rare flavour in malaysia, and the only good cherry icecream i hv had was haagen daz, and that costed a bomb! I wish soon I can have an ice cream maker to make ice cream for my kids..this indeed a very tempting and refreshing ice cream. I’m still trying to find my precious ice cream that mum has hidden somewhere so I won’t be able to make any for a while! Boo! 🙁 Cherries aren’t in season at the moment and the few I find are so expensive (roughly $40AUD a kilo). Every year during summer we always buy a huge batch (or many batches) of cherries though since they’re so delicious. Oooh, I can never say no to homemade ice cream! Love your cherry version, Nami! My family will love them. Thank you for sharing! I have finally bought a cherry pitter but I have yet to use it. Hmm, your cherry ice cream sounds like the perfect recipe to break it in with. Looking forward to your Thursday post! Nami: I had no ideia that July is the National Ice Cream Month. Thanks for this delicious recipe! I’ll have to make it. I love cherry ice cream… Actually, every time that I go to a gellateria, I have to order my favorite ice cream which is Amarena (black cherry ice cream). I love your son’s picture. He has charming cheeks. ;). Have a blessed week!!!!! I hope your next ice cream is ginger, I still want to make ginger ice cream! Oh Nami, this is just beautiful! I’ve never heard of cherry picking in Brentwood. I’m going to have to check into that. I don’t have any small children left but I would still like to go! I’m going to Pin this and come back to it next time I make ice cream. Hi, lovely recipe, do you have to use an ice cream maker? Can I do it by hand, the way ice-cream used to be made? Re: the cherry stoner, you don’t need one, just cut the flesh from the stone with a sharp small knife. Thank you Ruth! 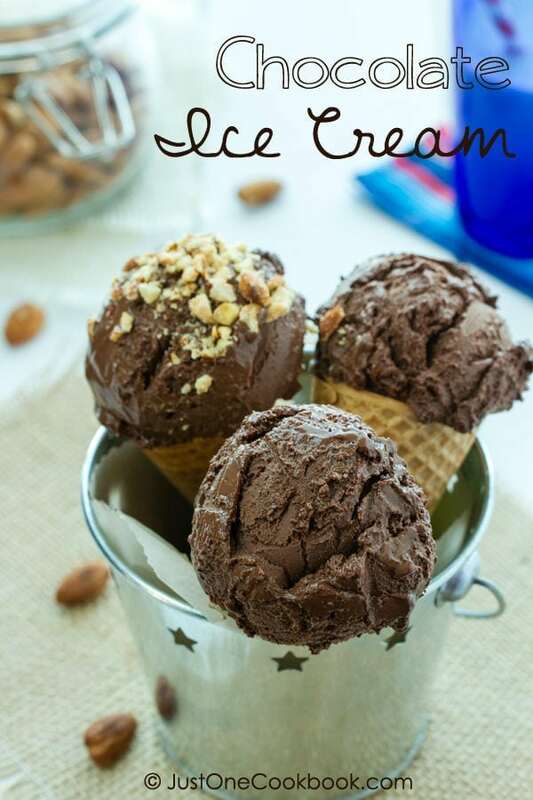 And you are right – you do not need an ice cream maker to make ice cream (in case anyone is interested, the link for making ice cream without machine is in Note section in the recipe). 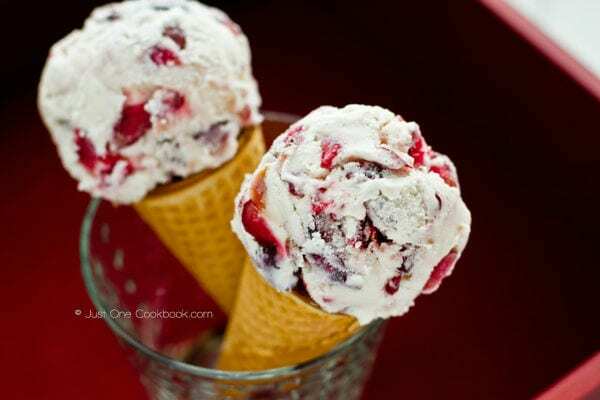 Nami….my mouth is watering at 8 in the morning after seeing thise perfect cherry laden scoops! I LOVE this recipe firstly coz I m a cherry grazer & secondly becoz there are no eggs …so I can enjoy them on those days when I eat only vegetarian food. I dont have an ice cream maker but I think, With all that cream, this will be quite creamy even if I make it in the freezer…I have tried with strawberries, cheeries should work too- Thanks so much for sharing..have a great week ahead! Ooh Nami your cherry ice cream looks so good. How fun to go cherry picking, I’ve never done that. I’ll have to get some cherries at the farmers market and make myself a batch of this. Yum! I’d be smiling too if I were one of your kids! Cherry ice cream is one of the flavours that I’ve got planned on making myself (just made blueberry last night to go with the mango-ginger) and I especially like the technique of adding in the chopped cherries at the last stage of the freezing. They’re selling wonderfully big and sweet cherries in the local grocery stores. My last attempt to add fruit in this way (strawberries) some years ago resulted in frozen little chunks of fruit which were unpleasant to run across but I’m hoping to do some fiddling to come up with something I enjoy which looks as tasty as yours. That looks divine! My daughter will love this! I think you have convinced me to buy an ice-cream machine! Adore this, Nami! I have seen so many cherry desserts today. Definitely need to pick some up soon to make some of these great things that I am seeing! This sounds totally awesome. 🙂 I love that your little one is helping in the kitchen. He’s so adorable. What a luscious ice cream, Nami! I’ve never made cherry before but I will now – thank you for sharing. I’m looking forward to Thursday’s flavor! that is some delicious looking ice cream! so fresh and full of cherries 🙂 i’ve yet to try a cherry one, because of the lack of the pitter. i’m thinking it is time for me to get one. Such beautiful photos, Nami! Love the colors! Is that you little guy pitting the cherries?! So cute! This ice cream looks like serious summer perfection!! This is one of my favorite fruits so I love the recipe of course. I so wish I could go cherry or peach picking. Just apples in fall. This looks awesome! Photos are great too, makes you crave for it:) I will try it too! Oh Nami, this is so gorgeous. Ice cream is one many yummy things that you create and your site is one of the ones that I refer to when I try make some at home. Have a good week, Nami! I didn’t know it was ice cream month;) Cherry season is something we really look forward to. Unfortunately we don’t have any farms near by, will have to look into better next year. Your children are very lucky to have homemade ice cream, great memories indeed:) The ice cream looks so good. You are really making some fantastic ice-creams… your family is so lucky… I bet they have such fun being your “taste testers”! Oh, I just bought some not-so-delicious cherries over the weekend, and I’m thinking they can be redeemed if I make some ice cream! Can’t wait to see Thursday’s flavor–azuki? Nami I love cherries and I missed them (we arein winter) are delicious! and this ice cream look awesome !! The pictures are awesome too! yum! the ice-cream looks fantastic Nami! What gorgeous looking ice-creams! I love your photos Nami, so lovely! Bet the ice-cream tastes as delicious as it looks! I could eat the whole tree of cherries! lol! Excellent, I’ve been crazy for cherries lately! I made cherry chocolate ice cream least year, and cherry clafoutis this year. Love the sweet cherries! I like the idea of adding the cherries at the end for chunkiness. looks so easy! will have to try it. What a perfect timing for an ice cream recipe. I have been sort of on my summer diet but I can never stop from eating ice cream. What a nice way to combine the cherry with the delicious homemade ice cream. great post! I had no idea that July was National Ice Cream Month! I’m always looking for a good excuse to make ice cream! I’ve never tried cherry before though – definitely have to add it to the list. Nami, this is such a flavorful ice-cream, you are turning pro in making ice creams! I love cherries and usually love them fresh, but this is really good! I don’t think that I ever ate cherry ice cream:) Got to try this without ice cream maker! By the way, your boy look adorable, but where is the other cutie pie? :) Thank you for sharing, will pin it for later! I can’t imagine better ice cream than with cherries.. well.. maybe cherries and chocolate 😀 it looks amazing! Nami, you are becoming an expert in ice-cream making! I love the way you have left whole cherries instead of mixing them into the rest and vanilla must be a perfect addition to cherries and cream. I’m looking forward to reading your Thursday post. It sounds very intriguing. Stunning images Nami! I love the colors, composition, and styling of the ice cream and it looks so delicious! I love cherries and I love ice cream. I have yet to try cherry ice cream. This recipe and your ice cream look divine! Will definitely give it a shot. Nami, I can’t get enough of your home fashioned ice cream and this one is especially gorgeous! Just look at those hand picked cherries glistening all over the cream. Your photos are stunning – full of light! Thank you for sharing this one. (love your little helper too! :)). 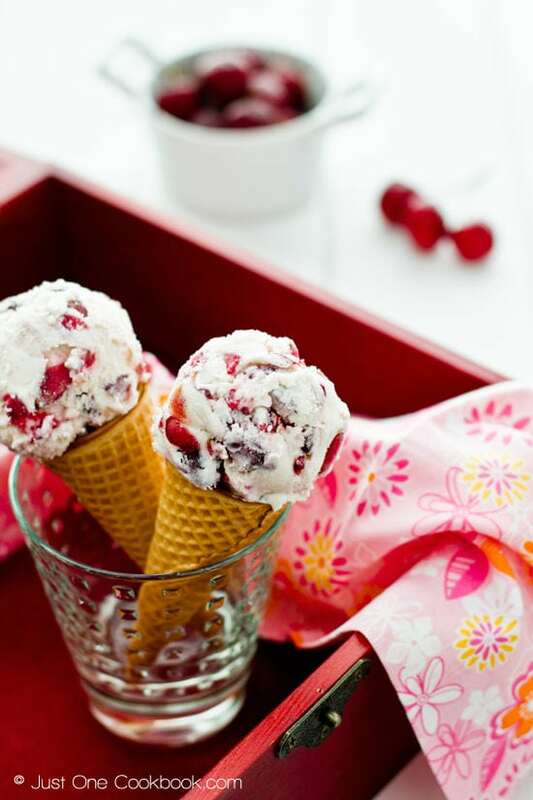 Ahh…this ice cream has one of the best summer ingredient – cherries! I love that you used vanilla bean. It is just brilliant to bring out the flavor of everything. I’m hoping that Mark will invest in an ice cream machine again since we’ve given the one we had in Malaysia away. For now, I can happily drooling at yours. I love the idea of using the vanilla bean! I have one in the pantry that I bought several months ago and it’s just sitting there. I also have some wild cherries that I just bought from the growers’ market. They are a little tart, but really, really good. This ice cream recipe looks perfect! Ohmigosh! I can’t imagine how this tastes 🙂 And its a recipe you get to clock time with your family making, double win! Looks delicious, Nami! I just love the photo of your adorable sous chef. Very cute! I am envious of your mild weather, I think it is supposed to be 113 here today! 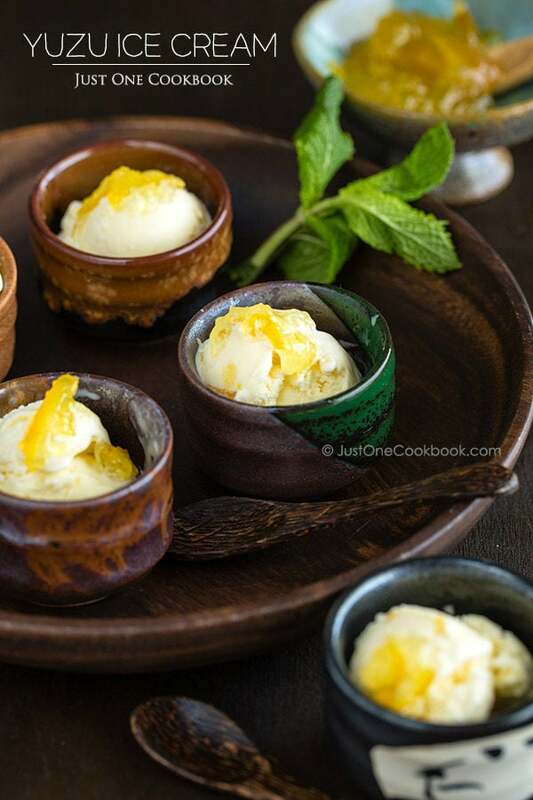 I was surprised at how easy it is to make home made ice cream, this recipe looks delicious. This cherry ice cream looks wonderful. I just got my first fresh cherries of the season and they are so, so delicious. I bet they would make a lovely ice cream. Can I send you some cherries and you send me back as ice cream? Just kidding! 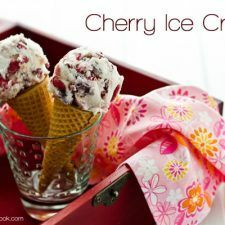 I LOVE cherry ice cream–this recipe is simple and your results look delicious! Will have to check out your clafoutis recipe, since the one I made recently was an utter disaster. Ohhh, it’s so hot here and I love cherries. Your icecream looks so amazing!!! Perfect for this weather! Your ice cream looks so delicious Nami! I always use vanilla beans too. It’s too hot here too and I have been putting my ice cream maker to maximum work. I can’t wait for Thursday! Nami, this looks so delicious! I don;t usually get cherry ice cream, but if it tastes as good as it looks, then give me this flavour anytime! I am seriously having a craving! Wow. This ice cream looks simply amazing. Yum! Don’t you just love the fruit from Brentwood – it is so fresh and full of flavor! Your ice cream looks wonderful and just wish I had a scoop right now. You have inspired me to whip up a batch of ice cream this weekend. Love your photos. This looks like summer in a cone! Just perfect. Your photos are so stunning as always and I love cherry ice cream. You don’t do desserts, I think your ice cream is the best dessert. fabulous! I imagine this would be even more incredible with some chocolate. What an awesome flavor! And man, I really need to get me one of those cherry pitters! I’ve been positively OBSESSED with ice cream lately! Love this. Here Nami is totally the opposite. We have temperatures at 40’s C and this weather is going to last until next Wednesday. This ice cream sounds like the perfect idea. I can see you had a very special help in making the ice cream! Hi Nami – your cherry ice cream photos are so cheery! Love the pic of your little boy pitting the cherries, what a great family event – from picking the cherries to making the ice cream. I’m sure they’ll have fond memories of this. Thanks again for your fabulous Guest Post on Taste With The Eyes and for helping me celebrate 5 years! 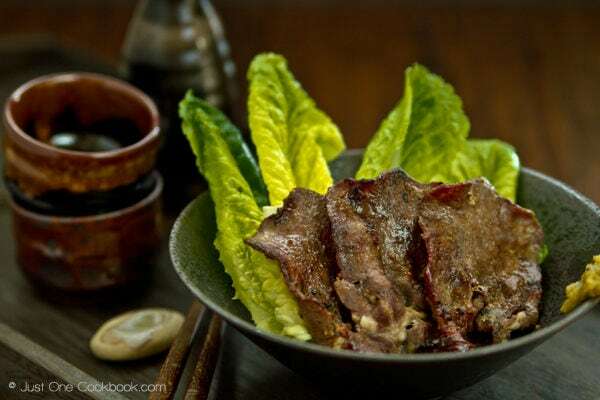 BBQ Beef Tongue was a hit! And I for one cannot wait to make it! Mmm..!! I’m obsessed with all of your ice cream recipes!! Cherry vanilla sounds SO good! Nice dessert! Cherry ice cream is so good (Cherry Garcia, anyone?) – this looks terrific. I agree having your own cherry pitter is a great investments. Works well to pit olives, too. Nice post – thanks. This looks lovely! I need a cherry pitter asap! Nami, this looks wonderful and the kids definitely look like they’re having fun with that pitter! Picking cherries sounds so much more fun than in our garden – this year we picked too early before the pigeons got to them and they were so sour I had to caramelize them and serve with savoury food. Would much prefer this ice cream. Oh how i miss the cherry tree i as in my previous house as it gave us loads of sweet and delicious cherries! 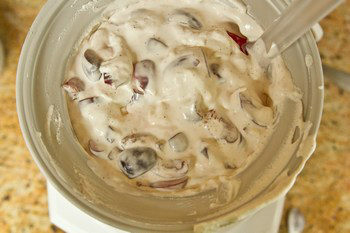 I really love how there are bits of cherries in the ice cream.. a great texture combination! This ice cream is beautiful, Nami! Whenever I buy cherries, I’m the only one who eats them and they start to go bad before I can finish them! This delicious ice cream would be a great way to use them! Aww, look at your son lending a hand! Lucky boy, he got to have fresh cherry ice cream! Looks amazing. Hello Nami 🙂 Sorry i haven’t dropped by lately ~ things have been a bit crazy busy for me hehe wow I didn’t know you’ve been posting sweet posts and ice-cream in particular WOO HOO! This looks amazing! I have 2 ice creams, well one is a sorbet, that I have planned for tomorrow so that the kids have some fresh cool treats. 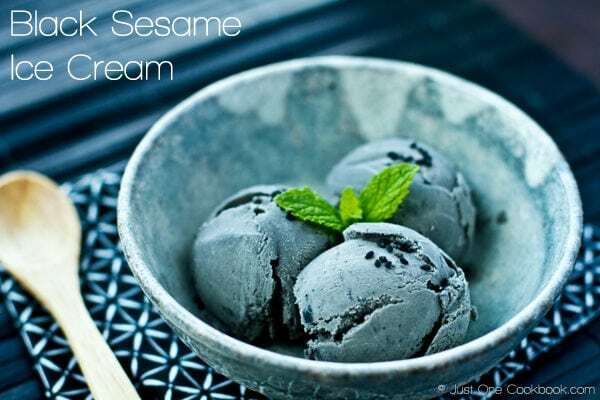 Now however, seeing your 2 lovely ice creams …I feel so boring 😉 This looks so good and I can’t wait to try the black sesame…delicious! Nami this is stunning. I am completely in love with this. Going on my list of things to make. Apparently I need to put a cherry pitter on the To Buy list so I can make this ice cream! sounds like a deliciously creamy cherry ice cream recipe!